BRUSSELS (AP) — European Union leader Donald Tusk urged U.S. President Donald Trump on Wednesday not to undermine the sides' longstanding trans-Atlantic ties by seeking economic gains through punishing trade tariffs. "Let me be clear: instead of risking a trade war, which he seems eager to wage, we should be aiming for greater cooperation," Tusk told reporters in Helsinki, Finland. "Make trade, not war, Mr President." The 28-nation EU is seeking an exemption from the U.S. tariffs on imported steel and aluminum that could kick in next week, and is preparing potential countermeasures against U.S. goods. German Chancellor Angela Merkel says she's counting on talks to resolve the trade dispute, but "can't predict whether we will succeed or not succeed." Merkel told ARD television that there needs to be a united EU stance, talks with the U.S., and, if necessary, the will to take counter-measures. She stressed that Europe has always said it wants fair trade relationships and Germany believes "protectionism is not the right answer." Mistrust between the long-time allies has increased since Trump became president last year, and the U.S. tariffs proposal has acerbated ill feelings. Tusk said it was not too late to turn this around and asked Trump to come through on his promise to exempt "real friends" from the tariffs. Harking back to two world wars and the Cold War, Tusk said: "I would like to stress today that the free world has survived the most difficult decades only thanks to the fact that Europeans and Americans have been real friends." "So let us cherish this friendship, not challenge it," Tusk said. And, he added, instead of threatening a trade war, Trump should restart the trans-Atlantic free trade negotiations between the U.S. and the EU which began under former president Barack Obama but were never finished. 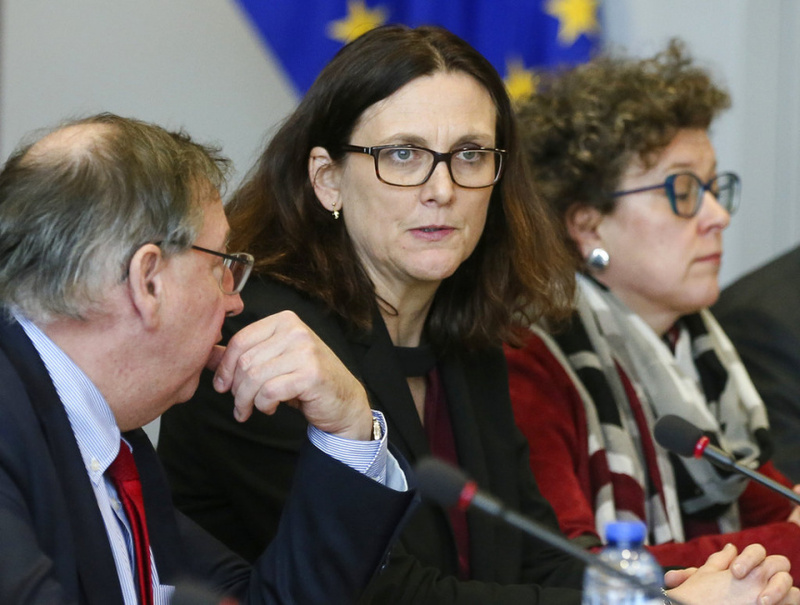 Trump has said that the tariffs are necessary on national security grounds, but EU trade chief Cecilia Malmstrom insisted this is a ruse: "We suspect that the U.S. move is effectively not based on security considerations but an economic safeguard measure in disguise." The trans-Atlantic rift over Trump's tariffs was evident in the EU legislature in Strasbourg, France, where parties of just about all persuasions lined up to criticize the U.S. plans. The EU says the best way forward would be for the U.S. to cooperate in trying to reduce a glut of steel and aluminum on international markets, which experts says is largely due to China's overproduction in recent years. "That is what makes the sound bites of the current U.S. administration so disturbing," said Marietje Schaake of the parliament's ALDE liberal group. "Right at the time we need to work together as the liberal democracies of this world to curb unfair trade practices of China and others, we are divided."